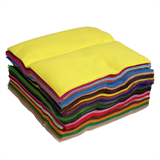 A pack of 50 sheets of felt made from 30% wool and 70% viscose, 2 each of 25 different colours. Ideal for when a softer felt is required, or when you prefer a totally natural fabric. Great for needle-felting, making small items, applique and general crafts. This is thicker and softer than the previous brand that we stocked.